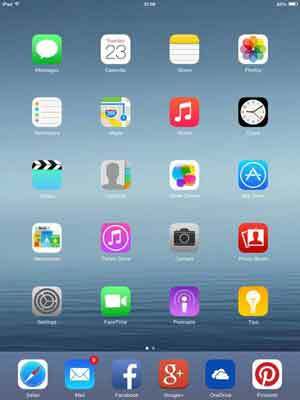 iPad update to iOS 8.x explains in simple steps how to update your device's operating system to the latest version (as of July 2015). iPad operating system updates are usually released every 12 months or so (with interim minor revisions in-between). It is essential to keep your Apples devices up to date. Many App programmers release updates to their programs that are only compatible with the latest version of the O/S. The update process is easy! The step-by-step process below depicts how straightforward this is. This page is part 4 of a 6-part series on the iPad. The series begins with a look back at the origins of the iPad revolution, and how this device ends up as the worlds most popular tablet. We next look at what I call your iPad Manual, which is a detailed user guide to help you get the most out of your device. We look at gestures, settings and managing your applications. Losing your device is not the end of the world. Learn how to use the Find My iPad tool and get it back, quickly! Next we look at the update process for iOS7, and part 6 covers the Latest iPad News from around the world via Google and Yahoo news feeds. 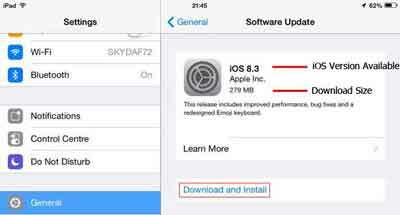 Here we review the steps for preparing to download your iPad's latest iOS update. Have your iTunes password to hand. The screen shows the update details for your device, including download size. Tap Learn More to read details of the main features added to the new O/S. 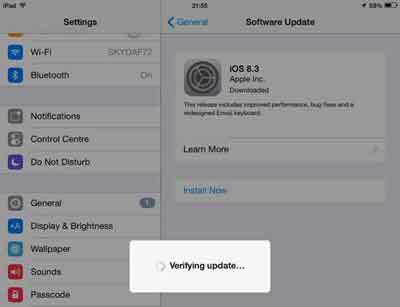 As Apple iOS updates are infrequent, the changes tend to be fairly major. I always read the detail so there are no surprises. Tap the Download and Install option. For iOS 8.x enter your Passcode when prompted, tap Done when complete, then tap Agree in the top right hand corner after reading the Terms and Conditions page. You did read all of the Terms and Conditions, didn't you? Few people read this information. It include fascinating details such as Apple's rights to change the software on your devices! I'm sure no one yet has tapped the Disagree option, have they? iOS update sizes vary. Updating iOS 7 presented a download size of 154MB. Updating to iOS8 presented 859MB. Updating to version 8.3 is 279MB - an insignificant size by today's standards. Download time depends on your device and broadband capability. Once the download is complete tap the Install Now option. The downloaded iOS file is verified to ensure there are no faults before continuing. A corrupt download will cause problems that are potentially costly to correct. After tapping Install enter your Passcode again if prompted. Next you are presented with another opportunity to read through the Terms and Conditions. Tap Agree when done. The update process happens automatically. Update time depends on the capability of your device. Although iOS update files are usually large, they are also compressed files. The unpacked size of the first iOS 8.0 update is around 6GB! The actual installation of the iPad update shows Apple's Logo and a progress bar. The next section is particularly relevant to those who are updating from iOS7 to iOS8.x. Those already on iOS8.x are unlikely to be prompted again to go through the following configuration settings. When the ipad update is complete, you are presented with the following screen. Slide to set up. Next enter your Passcode. A message appears confirming your iPad update completed successfully. Tap Continue. You are presented with the options not to enable services at this time, or set up new features. You are also prompted during the next steps to accept Terms and Conditions as discussed above (for iCloud in this instance). Also have your iCloud password ready if you decide to set up now. Next we look briefly at each of the 3 main choices. Location Services enables your device to track your approximate location when it is connected to the Internet over Wi-Fi or 4G. It is essential to enable if you use the Find My iPad tool. Location Services is useful if you travel a lot to unfamiliar places. 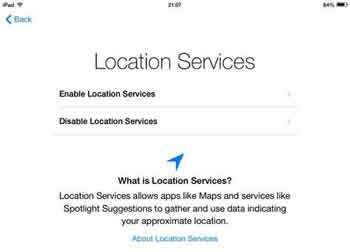 Maps show you where you are, and Services such as Spotlight Search (new to iOS8) depend on location services being enabled. The Laptop Guide (Opens New Window) has an excellent article on Spotlight Search for iOS8. 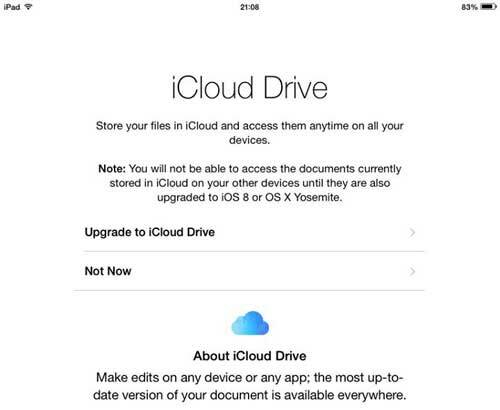 Apple's iCoud Drive is an on line file and data editing solution similar to Microsoft's OneDrive. I recommend you only update now if you in a position to update all your other Apple devices. 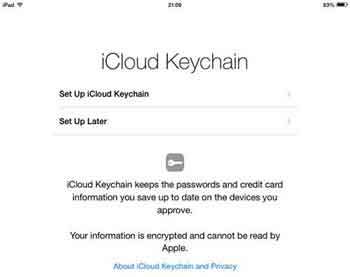 Ensure you keep your iCloud security code safe. If you forget it you cannot retrieve it! At the Welcome to iPad screen tap Get Started. You are now presented with the iOS8 desktop. Notice the additional icons such as Tips and Podcasts. See! Told you the iPad update process is a straightforward task. 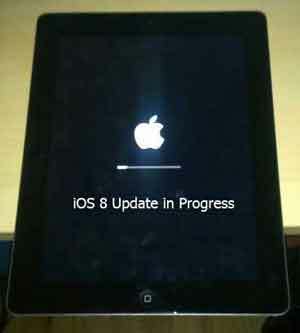 Although these iPad update tutorials focus on iOS 7 and iOS 8, the update process remains roughly the same. Therefore if you are reading this and Apple have released iOS 9 or even 10, the chances are either tutorial can help navigate you through the update process. Check your devices performance, Is it Better/Worse?